Note: These audio and video files are large. If you have a slow Internet connection, we recommend first downloading the file to your computer. 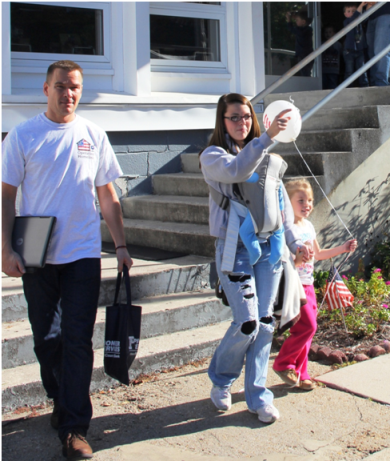 October 13, 2012 - Deployment just got a little bit easier for 200 families thanks to Operation Homelink. The nonprofit distributed 100 refurbished laptops and webcams, donated by Raytheon Company in Walton, Mass., Saturday morning to Marines, spouses and families of the II Marine Expeditionary Force of Camp Lejeune at the USO of Jacksonville. “I’m very thankful for this opportunity,” said Cpl. Fatme Tovias. Tovias will be deploying to Djibouti, Africa this coming December and will be using the laptop to Skype with her two-year-old daughter over her seven month deployment. “It’s very important to me to be able to connect with her,” said Tovias. “It will be a bit difficult to not be with her for Christmas, but at least this way I’ll be able to celebrate it with her.” The ability to keep in touch will help during the deployment, said Jennifer Anderson, the Family Readiness Officer for Tovias’s unit. “When you have the ability to communicate it shrinks the distance that you are apart,” Anderson said. Her husband Capt. Will Anderson of 2nd Radio Battalion has been deployed many times and she said she understands the strains that deployment can put on the family during a deployment. October 13, 2012 - Operation Homelink volunteer Kyle Klimoski helps Kristen Carr along with 4-year old daughter Emily and 2-month old Braxton carry the laptop and webcam she received from Operation Homelink today at the USO in Jacksonville, NC. Kristen, whose husband Cpl. Samuel Carr is deployed with the 2nd CEB of the IIMEF out of Camp LeJeune, received one of 100 laptops and webcams donated by Raytheon of Waltham, Mass. “Being able to talk with one another and see each other gives these families peace of mind and helps ease some of their worries,” Anderson said. “It provides them with a way to feel connected, so that they’re able to be part of holidays and celebrations even though they can’t physically be there.” Cpl. Jamie Whitehead, who is scheduled to deploy to Afghanistan in July 2013, will also be using his laptop to be able to keep in touch with his wife and two children. “This is a great opportunity to have a way to connect back to home,” he said. Julie Alldredge gets a little help from Family Readiness Officers Kim Cooley and Ann Morey bagging her new computer Saturday morning. Operation Homelink and Raytheon with support from the USO of North Carolina distributed 100 refurbished laptops and webcams to the spouses of the members of the II Marine Expeditionary Force aboard Camp Lejeune. Additionally, 100 new webbooks donated by Litl, Inc. were distributed to 100 junior-enlisted Marine families stationed at Marine Corp Air Station Cherry Point. Shannon, along with Kyle Klimoski, head of technology and web development for Operation Homelink, distributed the laptops to the Marines and spouses at the event. This is the fourth time that Operation Homelink has come to donate laptops to the Camp Lejeune and Cherry Point Marines and sailors. “The most rewarding thing for me at these events, beyond being able to provide the families with the means of communication while they are going through deployments, is being able to meet the Marines and their families,” said Shannon. At the event, Shannon met a spouse whose husband was already deployed to Afghanistan, who had three children with one on the way. Washington, D.C. – April 11, 2012 - Operation Homelink was recognized today as a finalist in the White House’s Joining Forces Community Challenge, an effort to recognize and celebrate the extraordinary efforts of citizens and organizations across the country that are working to improve the lives of military families. The twenty finalists were chosen from more than 300 nominees. The announcement comes at the one-year anniversary of the launch of Joining Forces, the national initiative started by First Lady Michelle Obama and Dr. Jill Dr. Biden to support and honor America’s service members and their families. The initiative aims to educate, challenge, and spark action from all sectors of our society--citizens, communities, schools, nonprofits, faith-based institutions, philanthropic organizations, and government--to ensure military families have the support they have earned. Founded in 2002, Operation Homelink’s mission includes providing laptops to wounded warriors and veterans, plus the facilitation of e-mail communication between American service members deployed overseas and their families back home. To date, Operation Homelink has distributed over 6,700 computers. “Jill and I are so proud of all of these finalists and the work that they have done for our military community,” the First Lady said. “Our military families demonstrate such strength, service, and sacrifice every single day, and we’re so grateful for everyone who is stepping up to give back to these families. “Operation Homelink proudly embraces the passion and spirit behind the Joining Forces Initiative, and we are honored to be selected as one of the Community Challenge Finalist” said Dan Shannon, Operation Homelink’s President and Founder. Shannon was accompanied at the event, held on the South Lawn of the White House, by two of Operation Homelink recipients: Mrs. Shawntea Crudup whose husband is currently deployed to Afghanistan with the Massaachusetts National Guard and Capt. Chris Yasher, retired veteran of the 75th Ranger Regiment and spokesperson for The Wounded Warrior Project. The anniversary events included a Pentagon reception hosted by Gen. Martin E. Dempsey, chairman of the Joint Chiefs of Staff, his wife, Ms. Deannie Dempsey, and Dr. Jill Biden in honor of Joining Forces Community Challenge finalists. Operation Homelink Provides 200+ New Webbook Computers to 17 Fisher Houses located across the U.S.
Rockville, MD – April 6, 2012 – Today, Operation Homelink, in collaboration with the litl, LLC, delivered 200 new webbook computers to the Fisher Houses located across the U.S. A Fisher House is "a home away from home" for families of military patients receiving medical care at major military and VA medical centers. There are 56 Fisher Houses located on 22 military installations and 20 VA medical centers. “The webbooks have provided our guests with the ability to communicate with friends and family take care of bills, look up directions and sites within our area, from the comfort of their rooms” said Josie Callahan, House Manager of the Fisher House at Camp LeJeune, NC. “The presence of the webbooks provides convenience for our families who are already dealing with stressful situations”. On April 6th, 2012, Dan Shannon, President of Chicago-based Operation Homelink, presents Holly Wright, House Manager of the Fisher House located in Hines, IL, one of twelve webbooks to be used by Hines Fisher House guests. Over 200 webbooks, donated by litl, LLC have been distributed to 17 Fisher Houses across the U.S. While all Fisher Houses provide a common computer area for their guests and some have computers in the rooms, this donation of more than 200 computers will ensure that every family occupying one of the Fisher House rooms will have Internet, email and videoconferencing capabilities within the privacy of their own rooms. The computers were donated by Boston Massachusetts-based litl Corporation. .”We are delighted to support the mission of Fisher House and be able to help our troops and their families” said John Chuang, CEO of Litl, LLC. “We believe that creating an environment that facilitates communication and enables closer family contact will accelerate and enhance the recovery process for our Heroes”. These webbooks will help ensure that such support goes uninterrupted and that chapters have access to high quality information.” The webbooks were provided at a joint hiring fair hosted by SVA, the U.S. Chamber of Commerce, and RecruitMilitary. The event featured 60+ employers and over 500 veterans, military spouses, and members of the Guard and Reserve. The hiring fair was a critical component of SVA’s 2011 National Conference, which was themed Combating Veterans Unemployment. “We are very appreciative of the support from litl in our mission to utilized donated computer technology to support US veterans, wounded warriors, service members and their families,” said Dan Shannon, founder and president of Operation Homelink. Including this donation, Operation Homelink has distributed over 4,500 computers to military families located across the U.S.
On Friday, December 9, 2011, Spc. Zarah Uncangro, husband Patrick, 4-year old Aveah and 1-year old Ezra, leave the Yntema Club with one of the 110 laptops and webcams presented to families of Fort Bragg soldiers who are set to deploy in the next 60 days. The donation was made possible by Chicago-based Operation Homelink and Waltham, MA-based Raytheon Company. While most service members have access to e-mail while deployed including sites throughout Iraq and Afghanistan, the situation is often different for their families back home. Troops rely on correspondence from family members during demanding deployments, but the families of many junior enlisted members are often not able to afford computers and must rely on conventional mail or expensive phone calls to stay in touch. The laptop computers and webcams were donated by Waltham, Massachusetts-based Raytheon Company. “I can’t imagine what it would been like if wasn’t able to email my wife when I was recently deployed, said Specialist Brandon Stone who was part of the detail assigned to support the distribution event and is set to deploy again in February. Tamela Edwards and 14-month old Richard, were one of 100 Fort Bragg, NC families to receive a Raytheon-donated laptop and webcam from Chicago-based Operation Homelink on Friday, December 11, 2011. “It’s Americans like those volunteering and supporting Operation Homelink that make me proud to wear this uniform……..proud to serve my country”. “I don’t have the words to express how much we appreciate the on-going support of Raytheon who with this donation have now made possible the donation of over 1,300 computers to military families and wounded warriors” said Dan Shannon, Founder and President of Operation Homelink. To date, Operation Homelink has distributed over 4,500 computers to military families and wounded service members at active-duty, Guard and Reserve installations and military medical facilities all over the U.S. "We congratulate Operation Homelink for its efforts to help families and deployed soldiers stay connected," said Rebecca Rhoads, vice president and chief information officer, Raytheon Company. "Raytheon shares the commitment to our heroic men and women in uniform and their families. Operation Homelink provides a way for us to combine high tech with high touch for a very worthy cause." 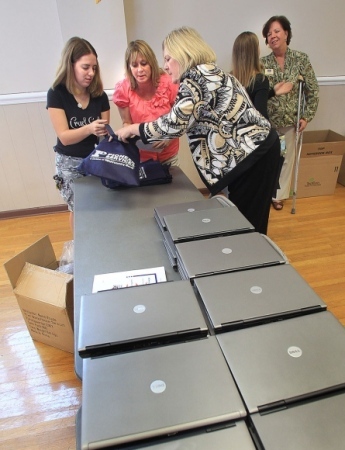 Spouses of soldiers stationed at Fort Bragg, NC received 100 donated laptops today at the Yntema Club at Fort Bragg, NC. The computers were donated by the Raytheon Company and bring to 4,500, the number of computers that non-profit Operation Homelink has distributed to military families across the U.S. since 2003. May 10, 2011, Ft. Bragg, North Carolina - Six paratroopers whose homes were destroyed or damaged in the April 16 tornados that struck south of post here recently received donated computers to help get their lives back online. Given mostly to lower-enlisted soldiers assigned to 1st Brigade Combat Team, 82nd Airborne Division, the refurbished, high-quality, business-class notebooks came from Operation Homelink, a nonprofit outfit that traditionally provides computers to the families of deploying soldiers to keep in touch through email, chat and webcams. Additionally, five laptops were donated to Marines affected by the same storm system at Camp Lejeune, located on the North Carolina coast. Dan Shannon, founder of Operation Homelink, explained that, while he typically needs 90 days to request and deliver computers from corporate donors such as Raytheon and Dell, Raytheon responded instantaneously to the emergency request in aftermath of Fayetteville's tornadoes. “As long as the mission is to take care of our troops and their families, it's an important mission to Raytheon,” said Robert Connors, Director of Preparedness at the defense contractor in an email to Shannon. It helped tremendously that the brigade's noncommissioned-officers support chain, beginning with its top NCO, Command Sgt. Maj. LaMarquis Knowles, was able to quickly find soldiers with the greatest need, said Shannon. 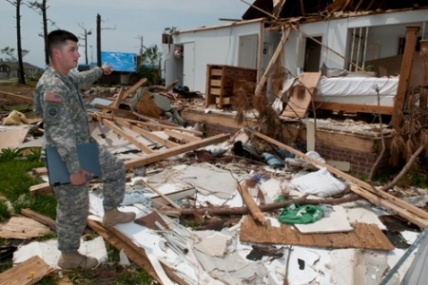 “This is really going to help,” said Spc. Desmond Marsh, a food-service specialist who, over two weeks after the storm, was still trying to get his life back together. Marsh left his rented home with his daughter and wife just seven minutes before the tornado struck. He returned to find the house in shambles and his two-year-old daughter's room completely blown away. To help him get back on his feet, members of Marsh's company contributed clothing for his family, and two on-post facilities, the Airborne Attic and the Lending Closet, loaned furniture, small appliances and other household goods. Marsh will use the computer to organize his life and to help keep in touch with his family, among other uses, he said. Spc. Patrick Briody, a medic with his brigade's cavalry squadron, also received one of the refurbished Hewlett Packard notebooks. Briody, his wife, Brittany, and the couple's 15-month-old child were huddled in a bathroom when a giant oak, felled in the high winds, split their home in two. He saw the family grill hurtling through the backyard at about 130 miles per hour, he said, and when the tornado had passed, his daughter's bedroom was gone. “Nobody was hurt. We were lucky,” he said, noting that he had to free his neighbors – a grandmother, her daughter-in-law and two grandchildren – from the rubble that was minutes earlier their home. The Louisiana native was impressed by the quality of the donated laptop. It was far from somebody's old junk, he agreed. To date, Operation Homelink has donated 3,565 computers to soldiers, Marines and their families, typically immediately prior to deployment, according to Shannon, a real estate manager from the Chicago area. Shannon was familiar with 1/82 from his third visit to Fort Bragg, an event in 2009 for which Dell donated 100 “Netbook” computers to families of the soon-to-deploy paratroopers through his organization. Homelink's last major donation was 150 computers to soldiers and families of the Minnesota-based 34th Infantry Division. 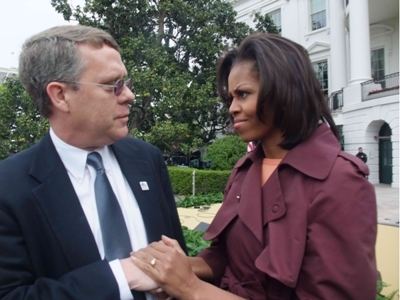 He is planning at least four more major donations in 2011, including one at Fort Bragg this fall, he said. Operation Homelink | 25 East Washington, Suite 1501, Chicago, IL 60602 Copyright © 2003 All rights reserved.